My name is Matt Keene; I work with the Environmental Protection Agency and coordinate the Environmental Evaluators Network. Chris Metzner (freelance graphic designer and data visualization artist) and Jeff Wasbes (independent evaluation consultant with ResearchWorks, Inc.) helped enormously with this post. 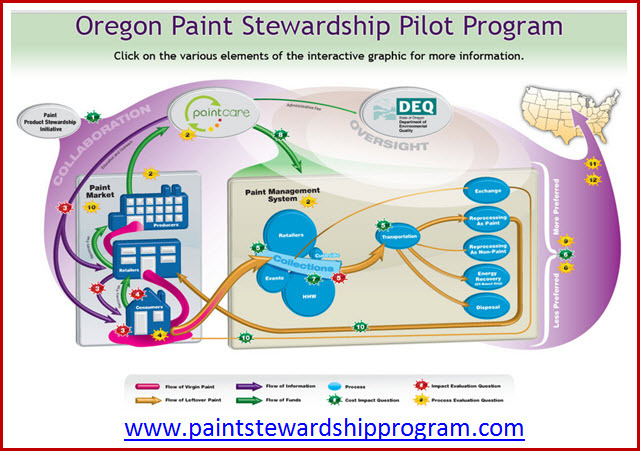 In 2009 Oregon became the first state to enact a law requiring paint manufacturers to manage leftover consumer paint. 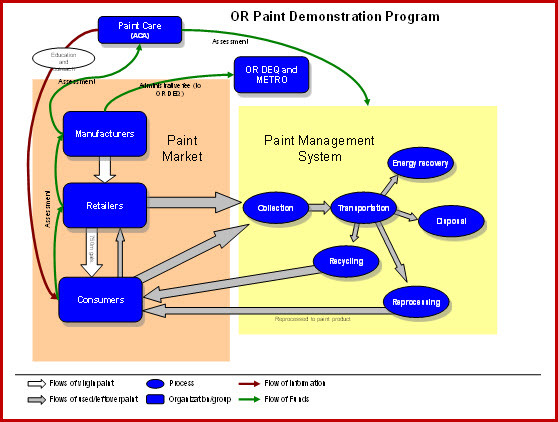 The law is part of the broader producer responsibility movement and requires the paint industry to implement programming to reduce paint waste, increase reuse and recycling, and dispose of unusable paint. We drew a picture for the paint people. But the paint people did not understand and they were unhappy. So we practiced on the drawing board. And we phoned, emailed, read, talked, napped, and cried just a little. Who made the paint picture pretty. Now the paint people understand and everyone is happier. 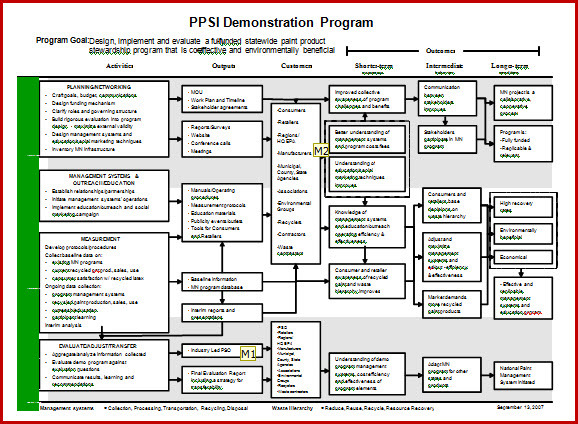 Integrating web 2.0, graphic design and data visualization with traditional logic models creates opportunities to expand the access and use of the evaluation process. 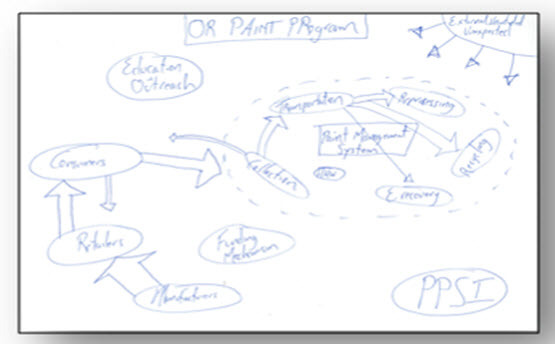 Fuzzy logic models aim to embrace fluid and approximate reasoning and varied context to improve the capacity of logic models to navigate non-linearity, feedback loops, and other concepts of complexity integral to the environmental programs and policies. Detail (or combinatorial) complexity describes the type where one must keep track of many variables and find the combination which yields the best (desired, efficient, effective) outcome. Dynamic complexity describes the type where cause and effect are subtle and where the effects over time of interventions are not obvious. This is the sort where we seek to understand the effects of system structure and feedback loops on outcomes of interest over time. Color: Organize your image by keeping your colors consistent across similar subjects. Overall, use a soft color scheme to keep users relaxed while viewing an intricate graphic. Balance: Though a graphic may be asymmetrical, flowing shapes, curving lines and blending soft colors convey balance through movement. The American Evaluation Association is celebrating Earthweek with our colleagues in the Environmental Program Evaluation AEA Topical Interest Group. The contributions all this week to aea365 come from our EPE TIG members. Do you have questions, concerns, kudos, or content to extend this aea365 contribution? Please add them in the comments section for this post on the aea365 webpage so that we may enrich our community of practice. Would you like to submit an aea365 Tip? Please send a note of interest to aea365@eval.org. aea365 is sponsored by the American Evaluation Association and provides a Tip-a-Day by and for evaluators. My name is Matt Keene; I work with the Environmental Protection Agency [JM1] and coordinate the Environmental Evaluators Network[JM2] . Chris Metzner (freelance graphic designer and data visualization artist) and Jeff Wasbes (independent evaluation consultant with ResearchWorks, Inc.) helped enormously with this post.